Card Text Action: Reveal any number of Mars cards from your hand. 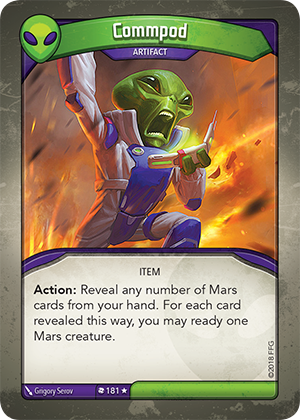 For each card revealed this way, you may ready one Mars creature. Can I use Commpod’s “Action:” if I have no Mars creatures in hand (for effects like “Each time you use an artifact, gain 1 Æmber”)? Can I use Commpod’s “Action:” ability to ready (and use) the same Mars creature multiple times? No. The entirety of Commpod’s “Action:” ability must be resolved before any other abilities or cards are used or played. Therefore, you would ready creatures with Commpod, resolving its ability completely before being able to use those creatures.